Vintage storage cabinet in metal in original condition ideal storage.. This vintage storage cabinet has recently been removed from a garage dating back to the 1940’s. Made of metal and it has a top section which lifts up to reveal a multitude of shelves, there are more shelves to the base of the cabinet finished with 2 doors. 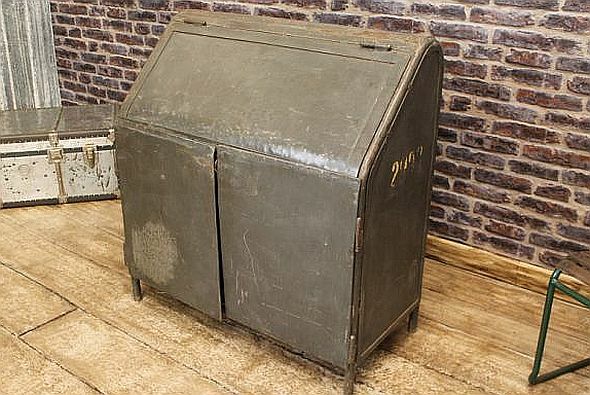 This original metal vintage storage cabinet would be perfect for all types of storage with an authentic vintage industrial style. This piece which dates to circa 1950 still retains it’s original grey finish and although shows signs of wear and tear is still in good condition. Perfect for Pubs, clubs, restaurants or any home this quirky vintage piece would be a real centerpiece to any interior. Ideal for kitchens and to mix with other pieces nothing can beat authentic items. The industrial, retro and vintage style has recently become very popular; apart form this cabinet we have other vintage and industrial pieces made of metal wood and other materials arriving weekly. If you contact us on 01543 375872 we will answer any questions on the cabinet or indeed any of our listings. Please note this listing is for the vintage storage cabinet only, the other pieces in the photographs are available on our other listings.